Praise the Lord that our Heavenly Father does not reward us according to our sins the way we deserve to be dealt with! Amen, teen girl?. Had it not been for our Saviour’s work on the cross, we would all be gonners! But the fact that we no longer have to worry about spending eternity in hell’s burning flames does not mean that it stops there. A good study on hell and what it has in store for those who are not born again and blood bought is so needed today! I can probably count on one hand the number of times the topic of hell has been the center of conversation in those Christians around me. I have maybe heard two messages in my 30+ years of salvation on the teaching of hell. Why is that? Not only do the lost need to hear where they will be spending eternity but I believe the saved would be more challenged to be soul winners if they had a clear understanding of where these lost souls are going! What is hell all about? The Bible mentions the word “hell” 54 times. There are three terms that are used to reference hell: Sheol, Hades and Gehenna. Most of Christ’s accounts of hell were referring to Hades and Gehenna. The most popular use of Hades was the account of the rich man in Luke 16:22-24. Here all of the rich man’s natural senses were affected by being in Hades. The account shows that the rich man could see what was happening, he spoke to Father Abraham, he could hear Father Abraham’s response, his mind was clear because he recognized where he was and where Father Abraham was, he cried to him for mercy, he asked Father Abraham to help his family on earth, he felt the pain because he thirsted and asked for water. All his senses were affected, as well as his emotions. He was so aware of his surroundings and what he was suffering that he did not want his family to go through the same thing. He knew he could not escape the torment he was in and it was too late for him, but not too late for his family. It was too late for him to be a soul winner at this point. Gehenna is another term for hell which refers to the Lake of Fire after Great White Throne judgment. Rev. 20:14 And death and hell were cast into the lake of fire. This is the second death. 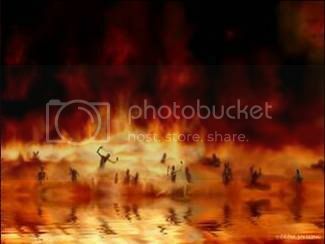 The souls in hell (Hades) will experience a second death at this point and be thrown into Gehenna (the lake of fire). Gehenna’s fires are so real that Jesus warned that it would be better to lose an eye or other part of our bodies than to be whole in the Lake of Fire! (Mark 9:43-48 ) That’s pretty serious stuff – to be told to cut off a part of your own body! Jesus said it is better that we cut off a hand and enter heaven a partial man than to be in that Lake of Fire with a whole body! Jesus also said in Matt. 18:8 that the flames are everlasting! Have you ever burned yourself on the stove or with a hot iron? The first thing I do is run to get a cold glass of cold water filled with ice cubes and dip my finger in it until the pain subsides. But this won’t be an option to the unsaved person who is cast here! Matthew 3:12 also says that the fires are unquenchable. It’s not like a campfire that dies down after a while. These flames keep going. My friend, all will stand before Christ and give an account of every action we have done. For we must all appear before the judgment seat of Christ; that every one may receive the things done in his body, according to that he hath done, whether it be good or bad. (2 Cor. 5:10) It’s reiterated in Rev. 2:23, And I will kill her children with death; and all the churches shall know that I am he which searcheth the reins and hearts: and I will give unto every one of you according to your works. I look at it this way, those unsaved who get “few stripes” will burn for all eternity at a level like being burned all over with the most horrible sun burn he’s ever had. The unsaved who gets “many stripes” will be burning at a level of being totally engulfed with fire!! Both will be suffering but at different degrees. However, they will all share equally in hell’s permanence (eternity) and its unquenchable flames – there will be no reprieve – there will be no death as a result of these burns. Granted, there is no way for me to know exactly the pain levels the lost will experience – this is just my interpretation which helps me to imagine. Whatever it takes for you to get a burden for the lost soul, do it! This is just my way of keeping myself motivated to win the lost. The unsaved stand no chance. Luke’s account of the rich man says it all. Once the unsaved dies, it is too late. There is no going back and changing one’s mind. The Hitlers and Neros of this world will suffer greater punishment once they are released from Hades and cast into that Lake of Fire. In my soul winning efforts, I’ve come across people who just don’t see their sin. They can’t be saved if they don’t know they are lost. But upon death, it will be a horrible awakening in a place where the worm dieth not. Christ spoke this statement three times in Mark 9:44-48. Not only is there no escaping hell’s fire for the unbeliever, but the pain and torment of being burned continuously goes on for all eternity. I cannot even begin to imagine what it will be like for a person to be engulfed in flames and to continuously be burned and their body not turning to ash – just continuously burning and burning and burning. Not for just an hour, a day, or a week – but forever! Christian, have I helped you to realize your need to tell your lost loved ones about where they will be spending eternity if they don’t repent and get saved? Prayerfully, this has renewed your zeal for lost souls! If not, shame on you. If you are reading this and you are not born again, won’t you reconsider what you believe today? You may not believe in a literal hell. Many may say that hell is here on earth. But Jesus did not preach that at all. Don’t take what others say and make it your belief. Could you possibly be wrong? Have you been right about everything in your life? What if you’re wrong about this? God created hell for the devil and his angels (Matt. 25:41). It is your choice to remain in the lost condition you are in right now. No one is forcing you to get saved. But admit this one thing … deep down inside you, you’re wondering if what I have said is even remotely true. I would rather exercise my little faith, be saved, and find out when I die that the Bible was true than to ignore my little faith and enjoy life full of sin only to find out that everything about hell was true and now I have to spend an eternity burning, writhing in pain for all eternity. That I need to show someone salvation’s way. We as Christians are so blessed because we do not only have access to God at certain times in our lives as those saints of the Old Testament. Today, the believer has full access, 24/7, to as much of God as he desires. But does the average Christian take advantage of this? Do YOU take advantage of this, teen girl? If this were an exercised privilege by each and every believer, the world would be experiencing a revival as never before. Fear not: What a weakness this is in many believers 😦 Oh that the Christian would get a handle on this early on in his spiritual life. Why was Isaiah fearful, I wondered? Old Testament saints did not have the indwelling of the Holy Spirit as Christians do today. Isaiah must have been feeling overwhelmed and fearful of the tasks at hand. So what was God’s response to him? … “for I am with thee.” God was reassuring Isaiah that He was there for this task. What a blessing for the New Testament saint because God is always with us through the indwelling of the Holy Spirit. He never leaves us!! 1 Cor. 6:19, 2 Tim 1:14 – The Holy Spirit lives within us and is, therefore, always to deliver us from our fears! Be not dismayed: The word dismayed means “deprived of courage.” Poor Isaiah. I have felt this way many times; especially when I am trying to give the Gospel to an unbeliever! Just look at God’s response to Isaiah’s dismay!! God said, “for I am thy God.” Nothing is too hard for God. It is He that gives us the ability to witness in His name. When we know that the Creator of all is the One who helps us in all of our endeavors, there is no reason to be deprived of courage. In fact, because the Holy Spirit resides within us, we have full resources! (Gen. 18:14, Jer. 32:17, Jer. 32:27) The word dismayed is not mentioned at all in the New Testament!! The Holy Spirit is God (1 John 5:7) and, therefore, God never leaves us (Heb. 13:5). Our God will uphold us. Notice that it is not by our own hand or might that we uphold our lives and circumstances, but it is with the right hand of HIS, God’s, righteousness! There is no righteousness in us (Isaiah 64:6). If there were, we would be inclined to believe that we can do it on our own. If there were, we would be inclined to believe that we can win our own way to Heaven! (Eph. 2:8-9) Isaiah points out that there is nothing good in our own righteousness. (Isaiah 64:6) Since we are being upheld by God’s righteousness because of the shed blood of Jesus Christ, then we can be certain that it is lasting and secure! Praise the Lord that it is ALL God that does the caring for us and not us! We will fail but God never fails! He is consistent and constant! It amazes me when I hear teen girls who know every word of every song out today! Yet, they struggle to memorize their Bible verses for Sunday School. Are we as excited about growing in the Lord as these girls are about their music? I haven’t met too many Christians who are – they are far and few apart. As I was reading today’s text, I couldn’t help but wonder what the Lord Jesus Christ was trying to teach His disciples. As you walk your path in life, you come into contact with people who are searching for spiritual fulfillment. Some go the way of various forms of Eastern religions, such as Hinduism (which is on the rise in many forms today), Buddhism, Shintoism, etc. Others seek out religions founded on Christianity but are works based. In other words, one has to contribute something in order to “be saved.” Christ’s work on the cross is just not enough according to them. But what was Christ referring to in today’s text? He did not say to seek after the ‘founder’ of a religion. He did not say to seek after someone who is smart or rich. In fact, the Lord said quite the opposite. He told us that we will be blessed if we hunger (seek) after righteousness. Purity of heart and rectitude of life; conformity of heart and life to the divine law. Righteousness, as used in Scripture and theology, in which it is chiefly used, is nearly equivalent to holiness, comprehending holy principles and affections of heart, and conformity of life to the divine law. It includes all we call justice, honesty and virtue, with holy affections; in short, it is true religion. This is where man’s religion fails. Religion produces “do gooders” but if one could see the heart, one would see sin. For all have sinned (Romans 3:23). So what must you do? First of all, one must repent and believe on the Lord Jesus Christ (Mark 1:15). People tend to leave out the repentance part, therefore, they do not “seek or thirst” after righteousness and their lives are no different than before they prayed their prayer. (2 Cor. 5:17) I hope that makes sense to you because it is such an important part of the Christian’s life. An idle soul will suffer spiritual hunger. The idle soul is busy with the day’s events and drama and does not care about seeking after righteousness. But to the Christian who desires to grow closer to the Lord Jesus on a daily basis, he desires to be filled. God’s word feeds us, convicts of our sin, and helps us to grow in His image. The more we are fed, the more we hunger for righteousness. Luke 6:25 Woe unto you that are full! for ye shall hunger. You can’t fill a cup that is already full, right? Neither can a “religious” person be taught anything of spiritual value because his religion’s laws supersede God’s word. He is not seeking or hungering after righteousness but is “full” of man’s works. Jesus was speaking to the Pharisees, the religious leaders of the Jews. They considered themselves righteousness (already full) and did not wish to hear that they were not as righteous as they thought they were. Are you fed today, teen girl? Are you seeking, hungering, thirsting after righteousness? Do you hunger for it as much as you hunger for food? Are you conforming and rectifying your life to Christ’s divine law? The Lord Jesus has promises for those of us who hunger after His righteousness. Revelation 7:15-17 Therefore are they before the throne of God, and serve him day and night in his temple: and he that sitteth on the throne shall dwell among them. 16 They shall hunger no more, neither thirst any more; neither shall the sun light on them, nor any heat. 17 For the Lamb which is in the midst of the throne shall feed them, and shall lead them unto living fountains of waters: and God shall wipe away all tears from their eyes. Many, O LORD my God, are thy wonderful works which thou hast done, and thy thoughts which are to us-ward: they cannot be reckoned up in order unto thee: if I would declare and speak of them, they are more than can be numbered. (Psa 40:5) This morning, my spirit is overwhelmed with thankfulness and gratefulness to my Heavenly Father. My heart is overflowing with blessings because I have a Father who loves me and cares for me. His face do I seek for comfort through all my trials and His Word do I search for direction. There is none like my God! He knows me personally – He calls me by name – He knows every single fiber of my being – He has the very hairs on my gray head numbered – He tells me that His yoke is easy! 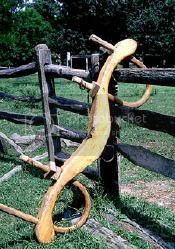 What yoke? The yoke of the Christian life. Once we are born again, he places His yoke upon us. Look at the picture above … notice it has two openings for the head? Does this not excite you? It does me! This shows me that my Jesus is right there alongside me, carrying the burdens, carrying my cross with me, helping with the load of care! Oh brother and sister in Christ, isn’t that just a spirit lifter? Oh how I love Psalms. As I read them, the Lord reminds me of verses elsewhere which tie in beautifully. Jer. 29:11-13 “For I know the thoughts that I think toward you, saith the LORD, thoughts of peace, and not of evil, to give you an expected end. (11) Then shall ye call upon me, and ye shall go and pray unto me, and I will hearken unto you. (12) And ye shall seek me, and find me, when ye shall search for me with all your heart. (13) Thank You, Lord, for being “right there” and so easily accessible. I no longer have to go through a high priest, priest or Mary – I have direct access to the Father through His Precious Son, Jesus Christ, my One and Only Mediator. You know my thoughts, my motives, my heart, my desires – there’s nothing You don’t know about me. Yet, You loved me anyway, despite my horrid sinful nature. My heart and my mouth will never cease to praise You! Have you ever been in a quandary like this psalmist? Have you ever been in a situation where lies were spoken against you yet the liar refused to see the error of his ways? If so, how did you handle it? Who did you run to? Did you run to others to gather your defenses? This psalmist ran to the Lord and cried unto Him. This is the perfect place to start, isn’t it?! God will deal with this offender – God will allow judgment to fall on this offender. God is not mocked. There is proper order to follow in Christ’s church. Go to the offender alone. If he doesn’t listen, take one or two with you. If he doesn’t listen, bring them before the church. If they still do not listen, they are to be regarded as a “heathen” (Matt. 18:17) or a “publican”! Verse 18 is even more interesting. Matt. 18:18 Verily I say unto you, Whatsoever ye shall bind on earth shall be bound in heaven: and whatsoever ye shall loose on earth shall be loosed in heaven. The Lord says that the offender may have moved on from your church to another, but if he still has not repented, his actions are “bound in heaven”! Once this offender repents, it is loosed in heaven. This offender may have moved on, possibly serving in another church, but his actions are still recorded and are still bound in heaven. How can his ministries be blessed? They can’t, not until he repents and his actions are loosed in heaven. I have read these verses many times but never associated verse 18 with the previous three verses. This is serious business! I recently heard a message on church discipline – it sure isn’t a topic you hear very often! It is a needed message in today’s world. Our churches are filled with lackadaisical Christians. They come once a week and think they’ve given God their all. You also have those Christians who are whited sepulchers – they appear righteous on the outside but their insides are like dead men’s bones. One of Pastor’s comments stuck with me. He said that the Lord put these verses on church discipline there so that we would learn to fear Him. Surely, we cannot believe that we can continue in our sin and get away with it. No, no one is perfect. We all sin. (Rom. 3:23) However, Matt. 18:15-18 deals with those who offend another and are confronted with it. Have you been offended by one of your brethren? Have you told them so? It could very well be that they haven’t a clue that they have sinned against you. Before you complain about it, pray about it! You then have clear instructions on how to deal with it in Psalm 120 and in Matt. 18:15-18. When you have gone to the Lord first and asking Him for wisdom and a heart for reconciliation, then you can follow the principles outlined in Matt. 18. With this inspired process, you chance to win a brother over. That teaches those who are spiritually immature to grow in the Lord. It teaches us to give grace to those who see their error and forgive them. But, on the other hand, if that person is unrepentant, the Lord provides direction in how to deal with that as well. God does not leave His children in the dark. He is the God of light and truth. (John 12:46) He provides the proper guidelines for us. I’m so thankful that we do not have to react as the world. Early in my Christianity, I was overheard by a believer when I spoke what I then thought was one of those “little white lies”! I praise God for that believer’s boldness toward me. She pulled me aside and corrected me and showed me in the Scriptures what I had done wrong. She was firm – but she was not rude. I remember that to this day. I remember how convicted and embarrassed I was and the Holy Spirit used that to “grow” me. If I had been prideful and refused to listen, I would have hurt not only myself but those I affected with my “little white lie.” Of course, there aren’t any little white lies – they are all lies. That would be what the father of lies would have us to believe. (John 8:44) A lie is a lie and I found that out quickly. I praise God for pastors like mine who do not fear to preach the whole counsel of God! I can’t help but think of Ananias and Sapphira and how Peter discovered their lie. The repercussions were severe – they were struck down dead because of it. Did it stop there? No. God used it in His church. And great fear came upon all the church, and upon as many as heard these things. (Act 5:11) As a church, we must fear the punishment that comes from sin and allow it to put fear into us of the judgment the Father would lay on us if we continue in sin. Pay day some day, as the old saying goes! The born again believer’s eternal security is secure but chastisement will come if we go unrepentant. Whew! This taught me not to mess around with God. We don’t hear messages like this very much and we truly need to. The church no longer fears – we have lost our testimony to the unsaved world – we live like them and think that we will go unpunished. Proverbs 6:6 Go to the ant, thou sluggard; consider her ways, and be wise: This is the first time the word ant appears in the Bible. I love how God uses different species to teach us a lesson. The ant is used to teach us how not to be a sluggard! As I was researching this strange little creature, I found out some interesting facts. Brother Lee Pierson, of Our Final Authority, was sharing his thoughts about the ant. I have always been fascinated with ants and other social insects. Ants have a structured hierarchy and each ant knows his function within his family. Each ant is born with a specialized function and he has been given the tools to perform his task. There are workers and guards, gatherers and builders. They grow gardens and milk cows and there are even some that just work in the nursery caring for the eggs. They work and sacrifice for each other and the colony. They do not get jealous of each other and they all work together as one. What a beautiful picture of how the church should be! Working as one unit for the glory of God! When I worked near a river that was overflowing with floodwaters, I really became impressed with the local ant colonies. It had stopped raining a couple of days earlier but the river had not yet crested. As the water level came out of the banks of the river and slowly rose to claim the surrounding fields, the local ants began to gather dry leaves and twigs to use as life rafts. When the water reached their nest, they all jumped on board their rafts and floated away hanging onto the raft and to each other! We are a lot like these ants. We can see the flood of judgment heading our way and we have our raft to float away on. Like the ants, we did not build our rafts we just accept God’s Gift when He provided the raft for us. One day soon, we are going to just float right out of this place! Thank you, Brother Lee, for your contribution! What a blessing this was to me. Two of my favorite verses in the New Testament were both penned by James. If any of you lack wisdom, let him ask of God, that giveth to all men liberally, and upbraideth not; and it shall be given him. (James 1:5) This wisdom is given by God, not man. God is not cheap – He gives us wisdom liberally to all men if they ask. Mankind has no excuse – if they don’t ask, they won’t receive it and be saved. How ashamed will the Christian be when he stands before Christ Himself having to justify why he didn’t read the Word! But the wisdom that is from above is first pure, then peaceable, gentle, and easy to be intreated, full of mercy and good fruits, without partiality, and without hypocrisy. (James 3:17) The world’s wisdom is of their father the devil. The world’s wisdom would be totally opposite of what God provides. Breaking down this verse truly blessed me. Let’s look at this verse as if it were the devil encouraging the world to get his wisdom: But the wisdom that is from below is first polluted, then tumultuous, unkind and wild, stubborn, unmerciful and evil fruits, having favorites, and hypocritical. Wow! This is the wisdom the devil wants you to have. We get this kind of wisdom in the world’s entertainment, the world’s goodies, and the world’s habits. Be careful! Learn from the ant – get wisdom and understanding as God’s Word tells us. And to Your wisdom turn. I wanted to do something unusual and not “obvious” in today’s God’s Goodness. I immediately thought about the body’s five senses. As I meditated on that this morning, I quickly recognized the Lord in all of our senses. We are so blessed! Of course, the first thing I noticed was the number five – for five senses. By now, you’ve noticed I have a love for God’s references to numbers in the Bible. The number five is the number for grace. I decided to look for God’s grace as it affects all of our senses. As I dug in, I was totally blessed and so I hope this is as much of a blessing to you as it was to me. Let’s look at the the first sense – sight. For since the beginning of the world men have not heard, nor perceived by the ear, neither hath the eye seen, O God, beside thee, what he hath prepared for him that waiteth for him. (Isa 64:4) Can you imagine this? Just think of the most beautiful waterfall or majestic mountain that you have seen. God says that your eye (or anyone’s for that matter) has never seen what awaits you in Heaven. Glory!! It amazes me how God intricately created the eye. Just the eye alone has so many parts and all work together to enable us to behold God’s beauty! Have we every stopped to think what we would do without our eyes? We would stumble in darkness. God likens the lost in this way: The way of the wicked is as darkness: they know not at what they stumble. (Pro 4:19) Does not this just illuminate the song verse “I once was blind but now I see”? Truly such amazing grace!! The sense of touch is next. Touch not; taste not; handle not; (Col 2:21) Wherefore come out from among them, and be ye separate, saith the Lord, and touch not the unclean thing; and I will receive you, (2 Co 6:17) We touch thousands of things in the course of a day. Our hands touch what our eyes see and our brain leads us to touch. We must be so careful to protect our eyes so that our hands are not led to touch what we should not. If we protected ourselves in this manner, we would be able to fulfill 2 Co 6:17 without a problem. Our desire (our heart) should be to touch what is good in God’s eyes. I love sitting with my Bible and running my fingers across its leather cover and eagerly anticipating my time spent in reading its blessed pages. I love to hold a rose and touch its velvet-like petals. I love to touch a baby’s skin and nuzzle my nose into its sweet, precious soft neck. Lastly, let’s look at the sense of smell. I hate, I despise your feast days, and I will not smell in your solemn assemblies. (Amo 5:21) God even used the sense of smell to reveal to us His desires and His will. God does not want the work of our hands – He does not want us to play religion. This verse says that God hates the smell of our unrighteous sacrifices. God wants us to have a relationship with Him. Man’s relationship with God was severed in the Garden of Eden. However, Christ came to restore that relationship. He has saved us and His sacrifice is the sweet savour that God smells. In kind, our testimonies should be a sweet savour to a lost and dying world. For we are unto God a sweet savour of Christ, in them that are saved, and in them that perish: (2 Co 2:15) The lost should be able to see that our “religion” is not one of burnt offerings of our own works but the blessed sacrifice of the Lord Jesus Christ. This is what they should see in us – our testimony should smell like a rose to them, not like a skunk. God’s Word has so much on the senses. I never gave it much thought until this morning. Just doing a word search in my Bible software showed me just how much God used the senses to teach us. What an awesome God we serve!